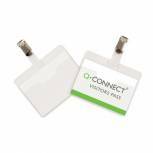 Q-Connect Visitor Badge 60x90mm (Pack of 25) KF01560 Pack of 1 Q-Connect Visitors Badge. 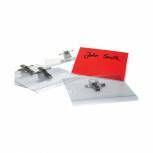 Clear name badges with drop level front opening for quick replacement of insert cards and rotating clip fastener. The ideal badge for use in conferences, meetings and exhibitions. Supplied complete. Size: 60x90mm. Durable Textile Badge Necklace 20mm Blue (Pack of 10) 8137/07 Pack of 1 Durable textile badge necklace 20 with safety release. 20mm wide necklace can be combined with all Durable name badges that have a clip cut out. Safety release opens if necklace gets caught. Length: 44cm. Colour: Blue. Durable Textile Badge Necklace 20mm Black (Pack of 10) 8137/01 Pack of 1 Durable textile badge necklace 20 with safety release. 20mm wide necklace can be combined with all Durable name badges that have a clip cut out. Safety release opens if necklace gets caught. Length: 44cm. Colour: Black. Durable Security Swipe Card Holder (Pack of 50) 999108011 Pack of 1 Durable security pass holder. 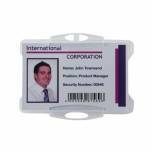 Single sided clear holder for ID passes and magnetic cards securely holds cards without damaging the magnetic strip. Can be worn with chains, straps or necklaces. Takes 54 x 85mm cards. supplied without strap. Durable Duo Security Swipe Card Holder (Pack of 50) 999108000 Pack of 1 Durable Security Pass Holder. Double sided clear holder for ID passes and magnetic cards securely holds cards without damaging the magnetic strip. Can be worn with chains, straps or necklaces. Takes 54 x 85mm cards. supplied without strap. Durable Security Badge 60x90mm Clear (Pack of 20) 8135/19 Pack of 1 Durable security badges with closing clip seals the pocket, securing the insert. Portrait or landscape position, size: 60 x 90mm. Durable Textile Visitor Badge Necklace 20mm Red (Pack of 10) 999107995 Pack of 1 Durable Textile Badge Necklace with safety release which opens if necklace becomes caught. 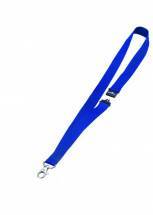 Suitable for use with all Durable badges with clips, pins or crocodile clips. Ideal for use with security pass holders. 440mm length. 20mm wide. Visitor. Q-Connect Voucher for Custom Door or Name Plate 250x50mm KF71442 Pack of 1 Smart Gold or Silver Desk or Door Sign made from aluminium with interchangeable engraved plastic laminate inserts. Supplied complete with self-adhesive backing and pre-drilled holes for mounting. Space for two lines of engraved text. Size - 250x50mm. 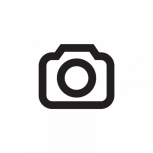 Q-Connect Combination Badge 54x90mm (Pack of 50) KF01567 Pack of 1 Q-Connect Name Badges with Combi Fastening. PVC badges to suit all occasions. Features transparent covers to protect but display name cards clearly and a pin/crocodile clip fastening on the reverse. Supplied complete. Size: 54x90mm. 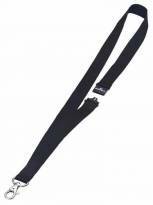 Durable Textile Staff Badge Necklace 20mm Black (Pack of 10) 999107997 Pack of 1 Durable Textile Badge Necklace with safety release which opens if necklace becomes caught. 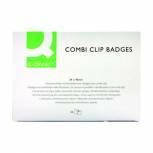 Suitable for use with all Durable badges with clips, pins or crocodile clips. Ideal for use with security pass holders. 440mm length. 20mm wide. Staff. Durable Textile Badge Necklace 20mm Red (Pack of 10) 8137/03 Pack of 1 Durable textile badge necklace 20 with safety release. 20mm wide necklace can be combined with all Durable name badges that have a clip cut out. Safety release opens if necklace gets caught. Length: 44cm. Colour: Red. 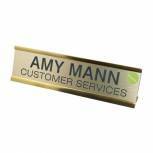 Durable Combi Clip Badge 40x75mm (Pack of 50) 8141/19 Pack of 1 Name badges for easy identification. Helps to prevent loss and theft. Combi clip provides a regular clip and a pin. Easy to insert and replace contents. PVC construction prevents damage to your ID. Size: 40x75mm. Pack of 50. Durable Visitor Badge with Clip 60x90mm Clear (Pack of 25) 8143/19 Pack of 1 Clear PVC badge with clip that seals pocket at top to prevent insert falling out. Size 60mmx90mm Landscape pack 25. 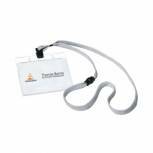 Durable Name Badge with Textile Necklace 60x90mm (Pack of 10) 8139/10 Pack of 1 Durable Name Badge with Textile Necklace. Quality visitors badge with textile necklace fitted with a safety release. the badge pocket is open at the top for easy removal of badge inserts. Badge Size: 60x90cm. 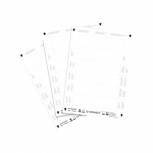 Durable Visitor Badge 60x90mm Clear (Pack of 20) 8136/19 Pack of 20 Durable Visitor Badge without Clip Pack of 20 8136/19. Clear PVC badges with blank insert card. Drop level front opening pocket. Punched hole on horizontal edge. 60x90mm. Pack of 20. 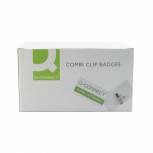 Q-Connect Combination Badge 40x75mm (Pack of 50) KF01568 Pack of 1 Q-Connect Name Badges with Combi Fastening. PVC badges to suit all occasions. Features transparent covers to protect but display name cards clearly and a pin/crocodile clip fastening on the reverse. Supplied complete. Size: 40x75mm. 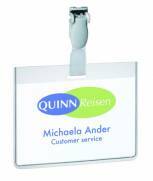 Q-Connect Name Badge Inserts 40x75mm 12 Per Sheet (Pack of 25) KF02288 Pack of 1 Q-Connect name badge inserts for use with the Q-Connect range of badges. Finely perforated edges allow a clean tear. Can be used on laser or inkjet printers. 40 x 75mm. 12 per sheet.